Happy Belated Cinco de Mayo! Chicken tortilla soup is one of those things that took me forever to try, even though Mexican cuisine is one of my favorites. I've only had it once, but I was so pleasantly surprised by the depth of flavor that I vowed to someday make it at home. Aside from the grilled chicken (which you could totally substitute leftover grilled or rotisserie chicken for), the recipe really is quite simple. I took my recipe from The Pioneer Woman because I loved her show when I had cable (and again when I had Netflix), and I'd never tried any of her recipes. This seemed like a good opportunity. As usual, I tweaked the recipe to my liking. To make the grilled chicken, preheat your oven to 375 degrees Fahrenheit. Mix the cumin, chili powder, garlic powder and salt together. Drizzle one tablespoon of olive oil over the chicken and sprinkle a little bit of the seasoning mix over both sides of the chicken. Set aside the rest of the seasoning mix. Place the chicken breasts on a baking sheet and bake for 20 to 25 minutes, or until chicken is done. Use two forks to shred the chicken and set aside for later. In a large pot (a seriously large soup pot), heat one tablespoon of olive oil. Add the onions, peppers and garlic. Stir and allow to cook for a little bit before adding the remaining seasoning mix and the chicken. Stir. Pour in the diced tomatoes, chicken stock, water and black beans. Bring to a boil and reduce heat to a simmer for 45 minutes, uncovered. Mix the cornmeal with water so that it's liquid enough to pour cleanly into the soup (much more water than in my photo below). Pour it into the soup and simmer for another 30 minutes. At this point, do a taste test and add more chili powder and salt to taste. Remove from heat and allow to sit for 15 to 20 minutes before serving. 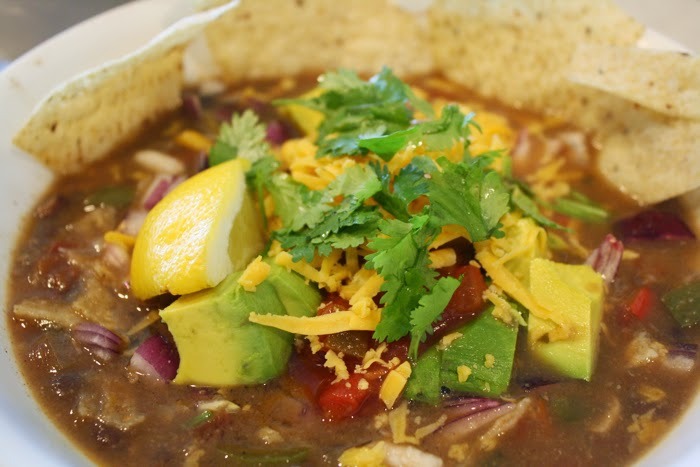 Crumble tortilla chips on top just before serving, and add a squeeze of lime or lemon juice to each bowl of soup. Add your favorite toppings (cheese, cilantro, raw onions, tomatoes, salsa, avocado, etc). I cannot recommend more that you adding toppings to the soup. Though it is a very flavorful soup, the longer it cooks, the more the distinct flavors meld together. The lime/lemon juice is indispensable and makes for a fresh, flavorful soup. Happy eating!